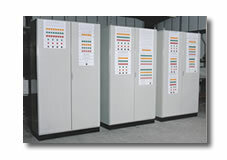 Since 1967 Kestral Controls have been manufacturing control panels and switchboards to serve a wide variety of industries. As one of the UK's leading manufacturers in this sector all of our products comply with the current European CE directives. We also supply third party accessories and hazardous area equipment assemblies in accordance with ATEX. More details. For your added benefit and convenience we are now able to supply a wide range of control panel accessories via our online shop. Key benefits include substantial discounts off the manufacturers list price, real time stock availability information, technical downloads and next day delivery. Online Shop.